A major piece of instrumentation at FRIB for nuclear astrophysics and low-energy nuclear structure and reaction studies is a H / He gas jet target system. The Jet Experiments in Nuclear Structure and Astrophysics (JENSA) system was constructed and commissioned at ORNL, then moved to the low-energy reaccelerated beam (ReA3) hall at MSU NSCL in preparation for use with exotic beams. It has been successfully reassembled and re-commissioned at ReA3 and will be used for a first experiment in March 2016. The JENSA team, led by Kelly Chipps (ORNL), has achieved the world's highest He density - 1e19 atoms per square cm with a jet of a few mm diameter. 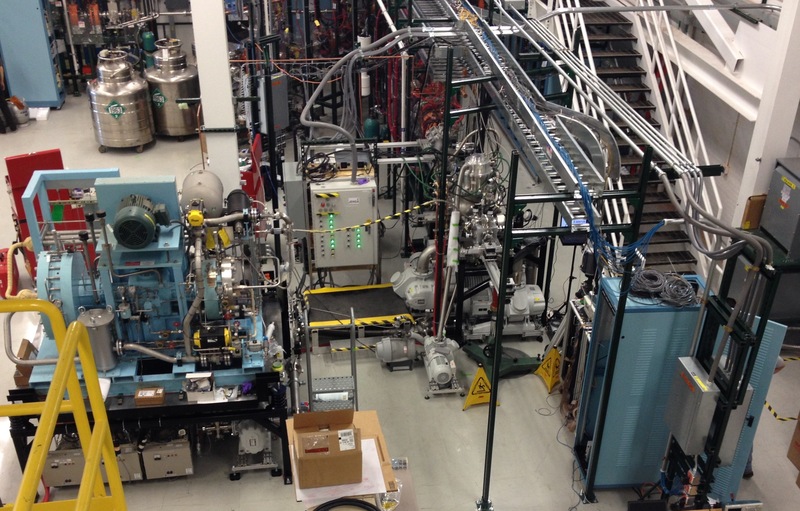 The JENSA target system -- shown in the image above left as installed at ReA3 -- can work in a standalone mode for measurements such of scattering, transfer, and reactions such as (p,alpha) and (alpha,p). JENSA will also form the front end of the SECAR recoil separator system for use in the direct measurement of H and He capture reaction measurements. There are also plans to run JENSA in an extended target mode (with a target region of length ~ 10 cm) which may be advantageous for certain capture reaction measurements. 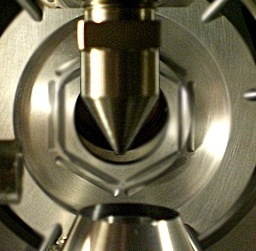 A closeup view of the Laval gas nozzle and gas receiver inside JENSA is shown in the image above right. The JENSA collaboration has beef formed to improve communication between different gas jet target systems. If you are interested in joining the JENSA collaboration, please contact Kelly Chipps (kchipps at nuclearemail.org). An overview of JENSA appeared in the July 2015 FRIB newsletter - please click here to see this article. For more information on JENSA, please visit the website jensajet.org.